This is in front of the Meridian Gate, through which is the Forbidden City. 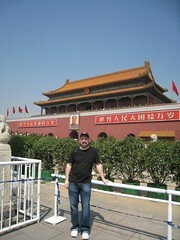 Across the street is the world’s largest and in many ways most significant and controversial square – Tiananmen Square. just careful management by the government. I think a combination of these factors is in play. Contrary to what I had expected, police security in China was not conspicuous at all. I don’t think this is from secrecy, rather in Chinese culture people simply do not challenge authority the way people here in the USA are used to taking on “the man”. Also I think in China it is considered more acceptable for the government to crack down severely when they are challenged. For this reason I think many Americans may wrongly think that there is a large desire for major democratic reforms in China. I think there is a *very* powerful desire in China to continue with the laissez faire business reforms that have brought prosperity to a much greater number of people than ever before, but I don’t think “democracy” is high on the personal agenda for most of the Chines on the street.